In the real estate industry, proper representation can make or break any transaction. Behind any successful sale is a confident home buyer, making their decision because they feel informed and assured that their money is being well-spent. Armed with this knowledge, realtors, real estate developers and other professionals in the industry are using visualization services to pre-sell homes before they are built, enabling them to move on to their next projects faster. A few months ago, we received an inquiry from a real estate developer who was interested in learning more about 3D renderings. After a discussing the uses of a holistic preconstruction marketing package, the developer signed on for a custom package that aimed to pre-sell the properties ahead of completing construction. [ The five-home development in the Pennsport section of Philadelphia was a highly sought out location. 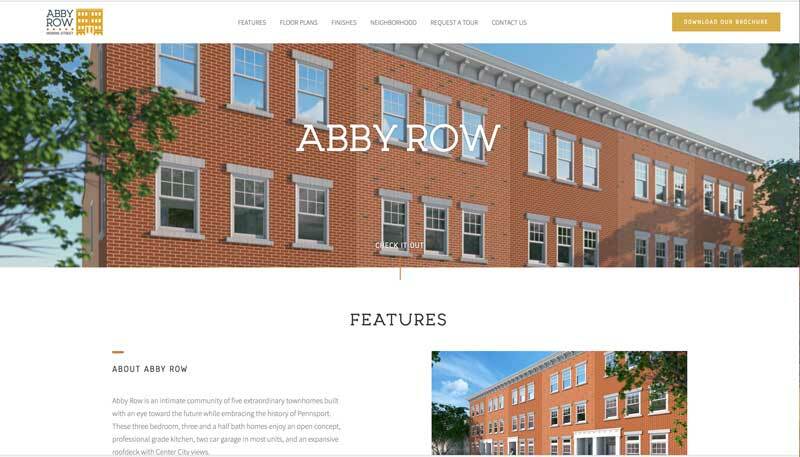 With a cohesive web presence, renderings, and details on the project - three of the five homes featured, were sold within 48 hours of launching the website. The following is an explanation of the assets, platforms and strategies that went into developing this campaign. The client was referred to us by another previous client who had also seen success in their project after engaging us for materials. When this developer approached us to learn more about what kinds of services could be used effectively to pre-market homes before construction had started, we laid everything out on the table. In order to determine which elements of pre-construction marketing would be most effective, we analyzed the architecture, price-range of the homes, target audience of the marketing and elicited the insights of the developer. Following our analysis, we suggested creating 3D floor plans, 2D floor plans, interior renderings and exterior renderings of the finished property. Once we had determined our strategy for creating the most valuable assets for prospective buyers to view the space, we offered to create the web and marketing presence. Although initially under the impression that they would need to engage a marketing firm separately, the developer was elated to learn that we could handle both sides of the project, saving them time and expense. Architecture firms that create marketing materials and are equipped to create a web presence around those materials are something of a rarity in the industry. We’ve learned through our study of the real estate industry and through our own practices, that 2D floor plans are rarely enough to make a home buyer confident in their purchase. 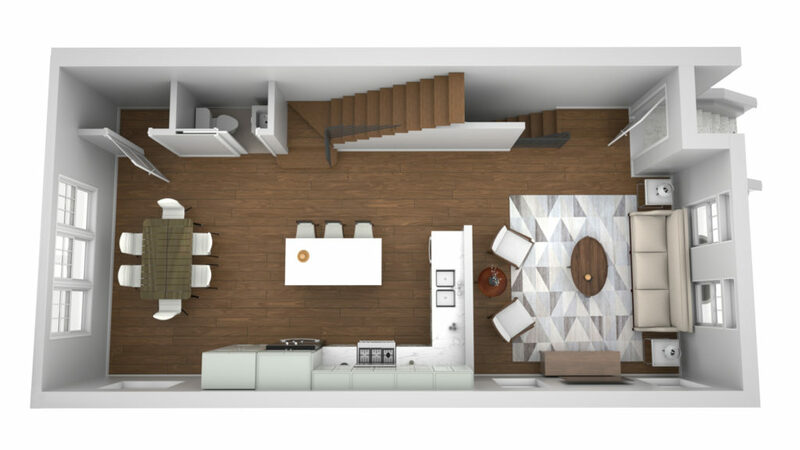 2D, when used in tandem with 3D floor plans, are often more effective, allowing buyers to understand the space, the staged layout and see the actual square footage of the property. At minimum, we recommend to clients that they opt for colored 2D floor plans. 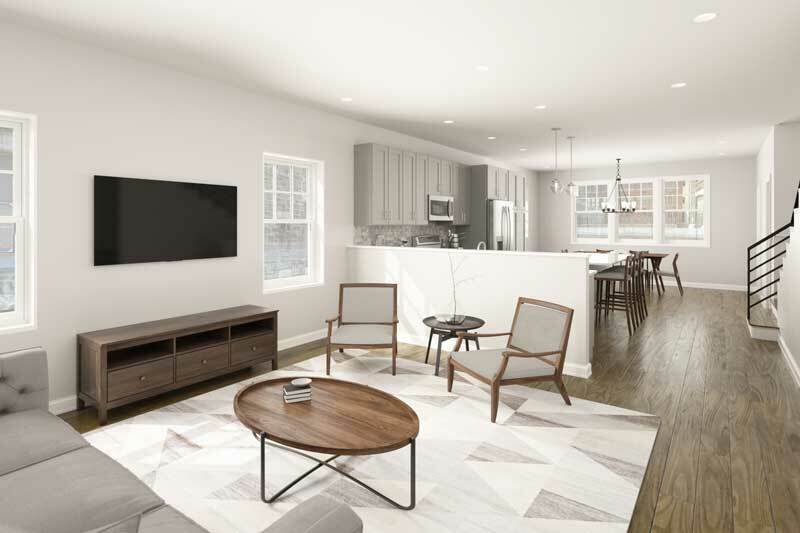 The developer for these Pennsport properties decided to contract both uncolored 2D floor plans and 3D colored floor plans. 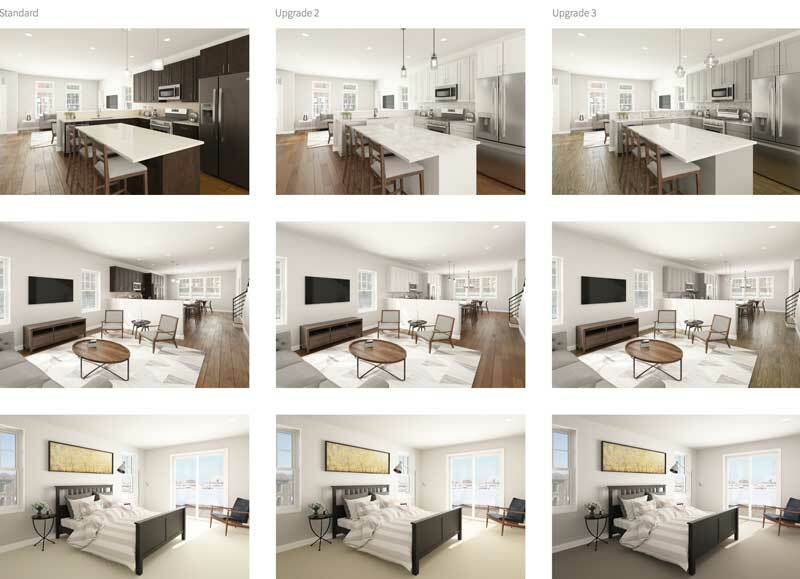 The price difference between the two options are not drastic, starting at $100 for one 2D black and white floor plan and $350 for the 3D option for single family homes. 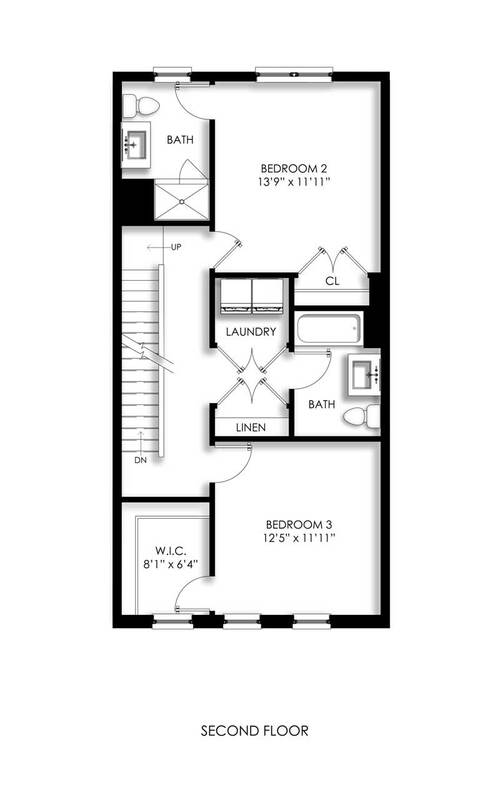 Black and white floor plans see wide usage in physical marketing materials like brochures, flyers and small posters. The allure of the 3D top-down view is often found on websites, internet ads and on large posters, but can always be used in other settings as well. Both of these options together allow for a more robust marketing presence, keeping prospective buyers engaged in the materials for longer. 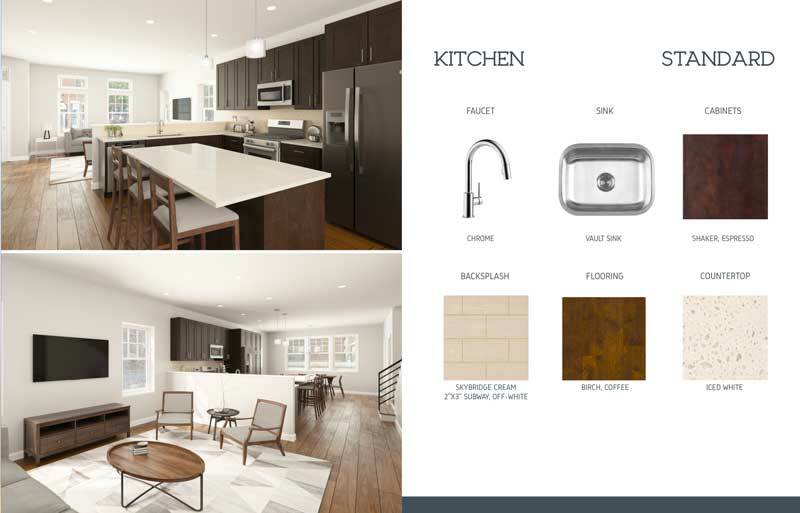 In the 3D floor plan, we emphasized the different materials inside the space such as the hardwood floors, countertops and bright white porcelain of the bathroom. The shading of the space is another important aspect of the representation, adding to the realism of the render and allowing viewers to feel as though they are seeing the inside of the home with accurate natural lighting and quality of space. While the floor plans were being completed,we also were creating full 3D renderings of the interior spaces. The most common scenes we render in our renders are that of the kitchen, living room and master bathroom. In most cases, a client will only need one full exterior rendering per property or development. However, when the property features a roof deck or other private outdoor space such as a pool, we always recommend that be rendered as well. This developer’s property did feature a roof deck, and so they opted for a rendering that featured people enjoying the views. 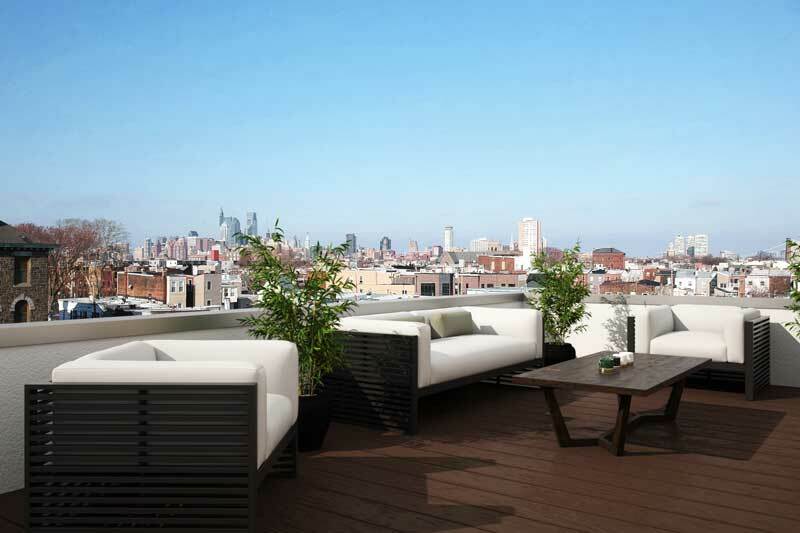 In striving for the utmost realism, our process for creating deck or roof deck renderings starts with the view. By flying a certified drone at exactly five feet above the top building height, at the precise perspective of the rendering, taking a picture and merging with the 3D rendering, we are able to provide the precise sightline that the homeowner will experience. Once we determined all of the perspectives inside the homes that we would need to show, we asked the client if they had separate trim levels that they would like to showcase. This was understood at the beginning of the project during the “Project Kickoff Meeting” The developer had plans to offer three different trim levels, something that we could help them achievet, by rendering all options over the same perspectives,making upselling the properties easier. 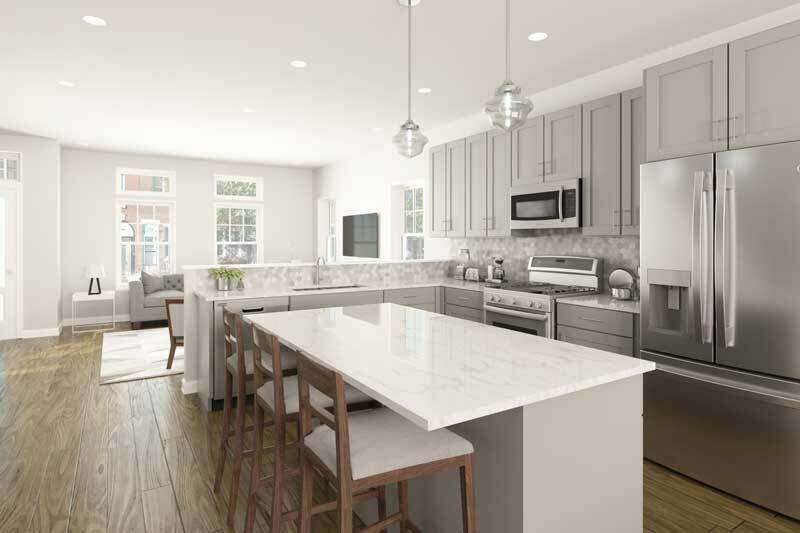 Our client asked for the additional trim levels to be rendered and once the base model renderings were complete, the process of replacing the different countertops, cabinets and appliances was relatively easy to perform. Once this was completed, it was important that the brochure be visible on the website, as well as printed booklets for open house events. The electronic and physical brochures allowed the developer to begin drumming up interest while we worked on the final element of their marketing package, an optimized marketing web presence. Depending on the needs of the client and the web presence best suited to an upcoming property, marketing website packages can cost between $2,000 and $25,000. The web presence we created for this client, while not our most premium option, was fairly robust. Our first step in creating a website, is to create a simple, easy-to-read logo. Then we move onto designing a mobile-friendly site, to make sure that every prospective buyer gets the same experience, regardless of the device they are using. Once the site was fully built out, with a clean look and intuitive calls to action, we went to work optimizing the site for SEO and PPC advertising. We delivered the finished website on a Friday afternoon and by Sunday evening, three of the five homes had already been pre-sold. Our client found the overall process of creating a fully-realized marketing presence complete with visualizations to be an easy and immensely cost-effective process. We have seen throughout our time offering visualization services that, on average, clients will pre-sell 50% of their properties when offering visualization services. Read more Designblendz case studies. Learn more about our visualization and marketing services. Brian is the CEO at Designblendz and started the company with a group of friends while attending college nearly 10 years ago. He is passionate about helping others achieve their business goals, including but not limited too, helping others with developing multi-family buildings, mentoring young entrepreneurs getting started in businesss, or speaking in front of audiences to share the latest virtual technology in real estate industry. Brian's holds weekly meetings with staff members to educate them on running a business.